Avène is really becoming one of my favourite French skincare brands as I try more and more of their products and as you will already know I thoroughly review all skincare products before I post my experiences and opinions on my blog and this was no exception. First up...I was a little sceptical when I received this product to review, as there are so many products out there that claim to reduce the depth of lines and wrinkles and often they fail to perform, or at best perform only slightly and leave you feeling somewhat disappointed with the results. I was also slightly put off with the syringe type packaging and to be honest I thought it looked gimmicky, so my first impressions were not the best. "An innovation in anti-ageing technology. With highly concentrated anti-ageing ingredients, it fills the most prominent wrinkles and deep furrows"
For anyone over the age of 35 that's concerned with ageing, whether male of female, then these are the words we want to read and for me being 50+ and having 2 deep furrow lines on my brow I was eager to give this wrinkle filler a chance. 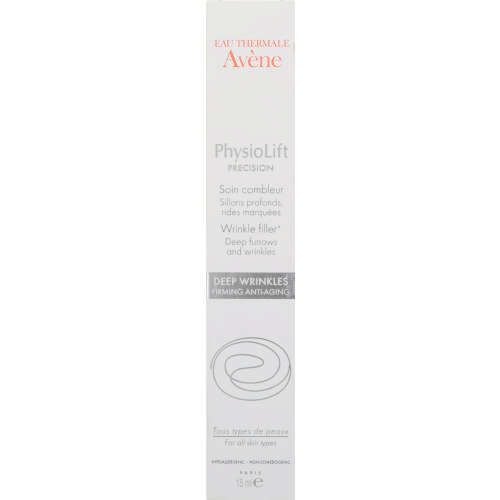 The Avène Physiolift Precision Wrinkle Filler can be used by all skin types including sensitive skins and is fragrance free.Use daily as the last step of your nightly routine. Another aspect of the filler is that its an expanding foam (which helps to penetrate deeper into the line or furrow), so a little does go a long way. On this point of application, this is my only complaint with the product, I found it quite difficult to hold the pen over the wrinkle and then click and twist the base at the same time, which I know sounds strange, but it's quite a long pen and it really was an awkward to angle and apply,so I ended up just dispensing onto my finger and then quickly massaging into my deep furrows and lines. Help smooth the appearance of deep wrinkles and firm the skin. An antioxidant, boosts the skin's luminosity. The emulsion also targets dull skin and signs of fatigue. All of the above certainly plumped up the two deep furrows on my forehead, which have always been a concern to me. Clinical tests revealed the following results, which I agree totally with, however I must start using the filler around my mouth, as I was so focused on applying to my forehead and my naso-labial folds (lines from the corners of your nose down to the corners of your mouth) that I forgot about the lines around my mouth. After my initial concerns, as to whether this product would work or not, I noticed pretty quickly that it did and it worked well, so much so that its become a product that I really don't want to be without and coming from me... that's quite something!